This dip freezes well. Always keep some on hand for unexpected guest. Cook beef over medium heat until no longer pink, stirring to crumble. Drain excess grease and return to heat. Add onions, green onions and bell peppers. Cook until vegetables are tender. Add ground andouille, soup and mix well. Add cheese and stir until melted. Season with spice blend to taste. Serve hot with scoop chips. This mouth watering, gut-warming gumbo is sure to please the whole crowd. In an 8-quart pot, fry chicken and andouille in oil for 15 minutes. Add hot water and bring to a boil. Mix roux with boiling water from pot until it is soft and smooth. Add roux to pot. Stir in chicken broth, seasoning and spices packets. Add Worcestershire Sauce. Cook uncovered over medium heat for 45 minutes to 1 hour. If desired, oysters should be added in the last 15 minutes of cooking. Skim excess oil and add gumbo filé. Serve over cooked rice. Yields: 8-10 servings. There is a perfect blend of spices and vegetables in this hearty soup. In a 5-quart pot, fry shrimp and andouille in oil over medium heat for 10 minutes. Add tomatoes and cook 5 minutes. Whisk together ⅓ cup of roux from packet into 2 cups of hot water. Add ½ packet of spices, potatoes, ½ packet of seasoning and blended roux to pot and cook for 15 minutes, stirring occasionally. Add corn and creamed corn with remaining 2 cups of hot water and cook on medium heat for 20 minutes or until potatoes are tender. Add more spice if desired. Yields: 8-10 servings. Jambalaya pairs perfectly with white beans and great friends. In a heavy pot, brown pork/chicken in oil for 20 minutes. Add sausage and cook for 5 minutes. Add all other ingredients, stirring until well blended. Bring to a boil. Remove from heat. Fluff with a fork. Let stand for 5 minutes. Yields: 8-10 servings. This moist flavorful pastalaya will have everyone wanting a second plate. Good thing this recipe make plenty. In a heavy pot, brown pork/chicken in oil for 20 minutes. Add sausage and cook for 5 minutes. Add all cans and liquids, stirring until well blended. Bring to a boil. Add pastalaya mix and return to a boil. Reduce heat to low, cover and simmer 10-12 minutes, stirring occasionally. Remove from heat. Let stand for 5 minutes covered. Stir before serving. Yields: 8-10 servings. This gumbo is a seafood lover’s dream come true. Try substituting one pound of shrimp with crawfish tails. In an 8-quart pot, fry shrimp and smoked sausage in oil for 15 minutes. Add hot water and bring to a boil. Mix roux packet with boiling water from pot until it is soft and smooth. Add roux to pot. Add crab meat, seasoning and spices packets. Cook uncovered over medium heat for 45 minutes. If desired, oysters should be added in the last 15 minutes of cooking. Skim excess oil. Serve over cooked rice. Yields: 8-10 servings. Substituting some or all of the shrimp with crawfish tails can only make this pasta dish more delicious. Cook pasta according to package directions, drain, rinse and set aside. Remove casing from andouille, quarter, slice and set aside. Sauté green onions and garlic in melted butter until wilted. Add andouille and shrimp. Cook until shrimp are done. Toss in cooked pasta and spice blend. Slowly, stir in half-&-half. Mixture will slowly thicken as it is stirred. When desired thickness is achieved, remove from heat, and let stand for 10 minutes before serving. 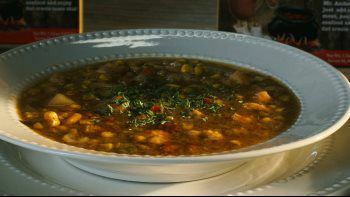 Using Bailey’s cooked okra cuts hours off the cooking time of this Cajun Creole classic gumbo. In an 8-quart pot, brown smoked sausage. Sprinkle seasoning packet over sausage, then add chicken broth, 8 cups hot water and spice packet. Bring to a boil. Whisk together roux packet with the remaining 4 cups of hot water. Add roux to pot, bring to a boil, reduce heat and simmer for 45 minutes, stirring occasionally. Add shrimp and simmer for 15 minutes or until shrimp are fully cooked. Serve over cooked rice. Yields: 8-10 servings. Like us on Facebook for more recipes! All photographs and graphics are the property of Bailey's Andouille, LLC. Any unauthorized use is prohibited.